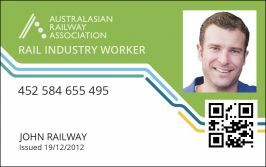 The Rail Industry Worker (RIW) Card Program aims to provide a single national competency management system for Rail Industry Workers. The program helps to meet regulatory requirements, comply with national rail safety legislation, and facilitates the potential for competency alignment in the future between rail operators nationally. The RIW Card is a smart card equipped with a QR code, with information stored securely in a third party database. The card aims to provide a single point of reference of current work roles and competencies of a rail worker nationally, providing flexibility for the transient nature of the workforce. For all RIW Card issues and general enquiries call 9752 8949 or email RIW. For more information please visit the RIW website.